Designed for use with several Garmin GPS chartplotters and handheld devices, SonarChart™ card provides bottom contour detail of up to 1 ft in U.S. and Canada and 2 m in South America. Product offers fast redraw speed when panning and zooming, and also includes navigational aids, providing complete resource for all boating activities. Garmin customers can record sonar logs and upload them to Navionics to improve their local charts while also benefiting from boating community’s contributions. Wareham, Mass. — Navionics, the leader in location-based content for the recreational boating and outdoor markets, announced today the latest version of its SonarChart™ card for use with several Garmin GPS chartplotters and handheld devices. The product, which features extraordinary bottom contour detail of up to 1 foot in the US and Canada and 2 meters in South America, now also offers a faster redraw speed when panning and zooming. This Garmin GPS customized version of the SonarChart™ HD bathymetry map offers the most detail available anywhere, and is great for increasing awareness of shallow waters and locating fishing areas at any depth level. 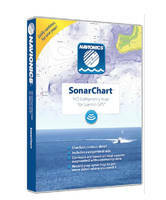 The SonarChart™ card also includes navigational aids, providing a complete resource for all boating activities. Not only can Garmin customers use SonarChart™ on their plotters and handheld devices, they can record sonar logs and upload them to Navionics to improve their local charts while also benefiting from the entire boating community’s contributions. SonarChart™ harnesses the power of the Navionics Community by accepting sonar logs from a wide range of plotters and mobile devices to ensure charts are up to date and accurate. Uploaded sonar logs from all users are integrated with existing data to generate a new SonarChart™ every day. Garmin sonar recordings take about one week to be integrated by Navionics and made available for download within SonarChart™. An updated SonarChart™ can be downloaded anytime, free for one year with the Freshest Data service. The new SonarChart™ HD bathymetry map for Garmin GPS card is currently available for regions within the US and Canada at $149, and the Caribbean, Central America and South America at $199, with other regions of the world planned for release progressively throughout 2015. Marine and lakes data are included together on the same 4 GB MSD card, which offers a great advantage for people who enjoy boating on both coastal and inland waters. Customers that utilize software version 2015.0202 or newer will no longer be able to use Navionics charts. To verify that a GPS chartplotter can display this product, visit navionics.com/compatibility, which is continuously updated. Existing customers can immediately take advantage of the latest enhancements by updating their charts via the Freshest Data service, which enables free updates for one year from purchase. For more information on the SonarChart™ HD bathymetry map for Garmin plotters, or to locate a dealer, please visit www.navionics.com.